So I hope you’re wondering why on earth I’m writing a blog about food from Cabo Verde. After all, B comes before M in the alphabet, and I did Cambodia in the first round – so what gives? A good meal starts with good beans. 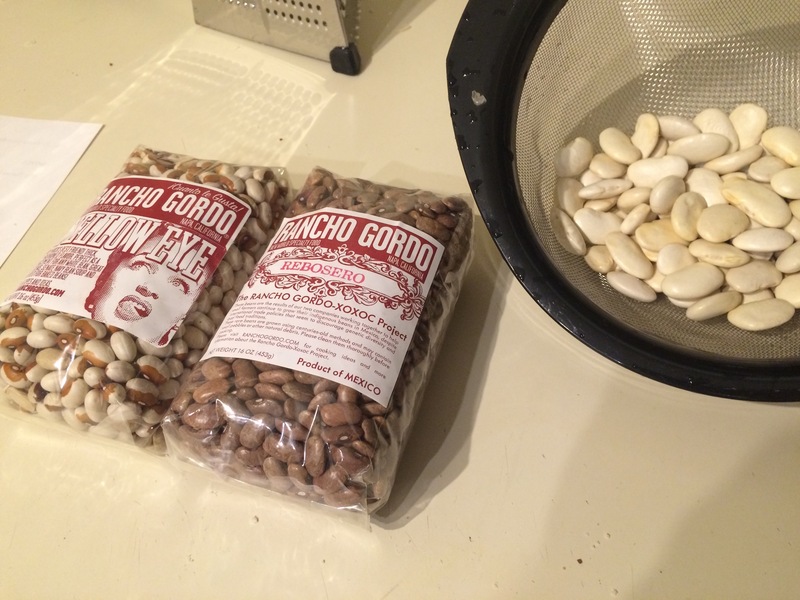 These Rancho Gordo beans are a personal favorite. Turns out, the country formerly known as Cape Verde had a humble request for the English-speaking world: Please call us Cabo Verde, instead. For a country whose exports are primarily reliant on frozen fish, it wasn’t a big ask. And most of the world quickly complied, going with the Portuguese spelling. This happened after I launched the blog, so Cabo Verde is now up, and only slightly out of order. And I am glad for this. It’s been awhile since I’ve had a good, new chili recipe. And here in the dead of winter (such as it has been in Portland, which is to say, more like spring), there’s no better time for that. Cachupa, to be clear, is not chili. It’s a thin stew or a thick soup. But its backbone – beans and hominy – has a lot in common with the chili I love to make on cold nights. Toss in more Tails & Trotters meat – this time salt pork and choriço – and cachupa was a clear, delicious, easy-to-make winner, if not a skosh time consuming. 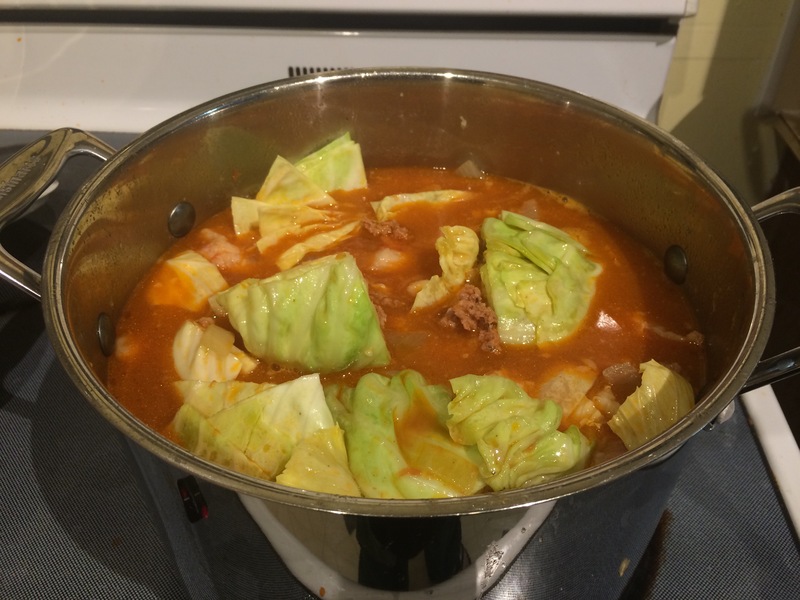 This recipe was based off of several others, primarily Raymond Almeida’s. Boil those beans! Boil that corn! I tried cabbage in my meal, but the sulfury brassica really put off the great flavors in the cachupa. I pulled it after one serving and don’t recommend it. In a large stock pot, boil corn in 4 quarts water. Add hominy, simmer for 30 minutes. Add another quart of water, return to boil. Add beans, 1 bay leaf and 2 Tb olive oil. Bring to a boil, then reduce heat to a slow boil. 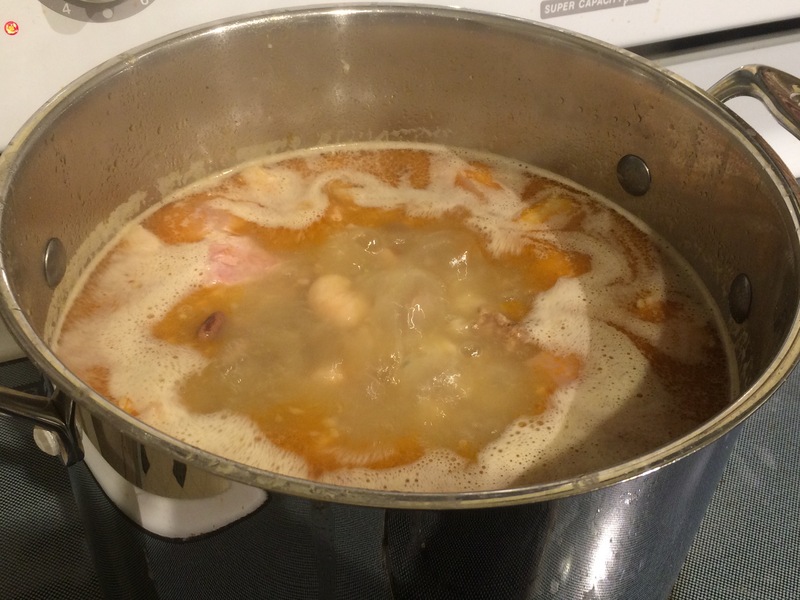 Add salt pork and cook at a heavy simmer until beans and hominy are soft. Make sure there’s enough liquid in the pot to cover corn and beans. After 60 minutes, add any pork meat and sausage. Cook for half an hour before adding refogado (next instruction). Sauté onions and garlic in oil until well carmelized. Add tomato, sauté for another 5 minutes. Add sautéd refogado and bay leaf to the stock pot, and cook for 30 minutes. Add squash, and cook for another 30 minutes. Remove from heat and let sit for 20 minutes. Remove salt pork before serving. A bowl of delicious, hearty cachupa.